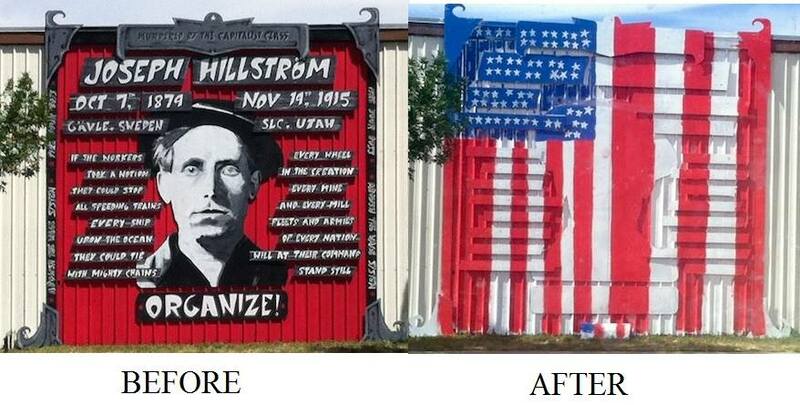 Over the four-day Thanksgiving weekend, something like a dozen outdoor murals in Salt Lake City were vandalized. Some murals were on the walls of commercial businesses, others were decidedly non-commercial, like this wall, belonging to The Bicycle Collective, a great non-profit organization that provides low-cost bicycles and bicycle parts to the community, as well as a shop where people can work on their bikes. Also attacked were some murals that were created this summer during “Mural Fest,” a public art event spearheaded by another cherished local nonprofit, the Utah Arts Alliance, in collaboration with the City of South Salt Lake. My personal favorite damaged public art is on the wall of a former art gallery. It features copies of famous artworks with the main figure missing, so you can photograph your friend posing appropriately as the subject. Included are Whistler's Mother, Munch's “The Scream,” Boticelli's “The Birth of Venus” and others (below). For years, graffiti artists have worked under an ethic that respects the work of others and eschews the defacing of pre-existing artwork. 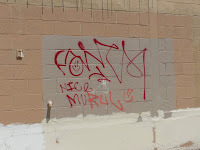 While I was working on a mural this summer, some local taggers left us this note one night on a section of wall we hadn't yet painted: "Howdy! Nice Mural!" 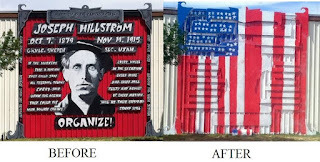 In the rare event that murals have been vandalized, the motives have usually been clear and political, like the mural below, a celebration of early-20th Century Union Organizer Joe Hill, which was defaced by right-wing vandals in 2015, less than two weeks after its creation. The organized effort of last weekend is something new that has also recently been seen in at least a couple of other American cities. Unlike traditional guerrilla art, mural bombing has little thought or vision behind it. It's a revolution of dilettantes. I've heard some in the local art community describe these bombings as a counterattack against a cultural appropriation. They say that public art involving an exchange of currency treads on the territory of the street artists, and such a backlash is to be expected. It's likely that this accurately describes the motivation of these attacks, but to give these vandals credit for being the voice of street art culture is ridiculous. They're nothing of the kind. They're the whine of a petulant little club of amateurs. Derek Dyer, the director of the Utah Arts Alliance, has started a gofundme page to raise funds for the restoration of these murals.